PHTK protesters launched slaugans against journalist, radio show host Jean Monard Methelus and threw stones on the building, breaking several windows. 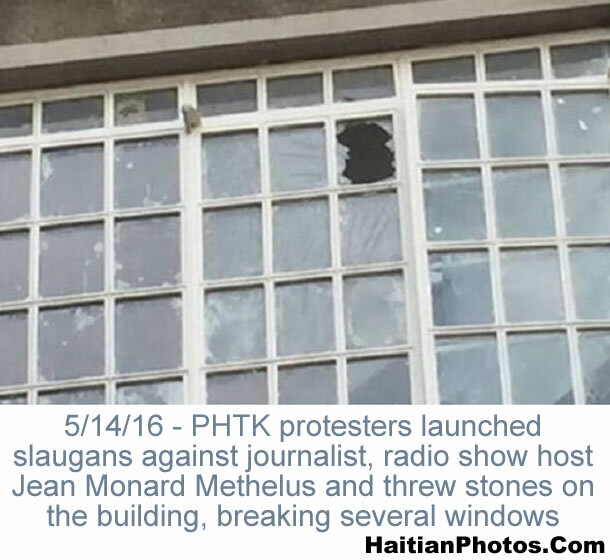 On Saturday, May 14, 216, the supporters of former President Martelly shouted slogans against journalist and radio show host Jean Monard Methelus and threw stones on the Radio Caraibes building, breaking several windows. It appears that PHTK, the Political Party of former President Michel Martelly, no longer believes in non-violent protests. The violent protest was led by Fednel Monchery of Repons Peyizan and Jude Lajoie of Platfom Viktwa-- both are defenders of Martelly's handpicked presidential candidate Jovenel Moses. PHTK has already disapproved the audit commission created by the provisional president Privert to check the credibility of the election. The agitators were demanding to continue the controversial election which is presently under the scanner of the verification commission. However, the demonstrators consider this delay caused by the audit/verification is in violation of the accord signed earlier, as it is nothing but a step to cancel the earlier election held in the Martelly regime.